Most people have heard the story of the "big one" that got away. In this case, the entire species went away. I grew up hearing fish stories from my Dad about the Blue Pike they caught in Lake Erie when he was young. My Dad and many others would agree it was the best tasting fish to ever come out of Lake Erie. The once plentiful fish became non-existent in Lake Erie due to over-commercialized fishing and pollution. Different organizations have taken action to preserve the different species of fish that Lake Erie has to offer. Strict laws and regulations protect Walleye and other species of fish and amphibians in Pennsylvania. When the fish is in season, it still must be a certain length to be kept. If not, the individual must return it back into the water it was caught from. The Executive Director of the Pennsylvania Fish and Boat Commission determines the limit of Walleye and Yellow Perch an individual can catch each year in the spring. In the spring of 2013, it was announced that the limits will remain the same as the previous year. This is another step in preserving our game fish for future anglers. Erie County has many different "fishing holes" including creeks, streams, ponds, and smaller lakes. Generally, anglers will choose an area according to the type of fish and season. If you are not sure where to go, stop in any local bait shop and ask, "where are the fish biting?" Bait shop owners are well informed on the best places to fish for specific types and will suggest the type of bait the fish are hitting on. PA Fish and Boat Commission: This site contains an interactive map provided by Google. Anglers and boaters are able to see an aerial view of the areas they wish to fish and boat. The regulations and laws on fishing in Pennsylvania are located on this site. Department of Conservation and Natural Resources: This site offers maps that let you pick what region of Pennsylvania you are interested in. There is a link for Special Places which guide individuals to scenic sights, old growth forests and geologic wonders. Green Tackle: This is an environmentally friendly fishing tackle website where biodegradable lures and fishing line can be purchased. They also sell lead free hooks and sinkers. Also on the website, you can click on the links for "fishing line pollution" and "green fishing" to learn more. Sons of Lake Erie: A fishing club established in 1981, Sons of Lake Erie is determined to keep the well being of Lake Erie their number one priority. The Sons of Lake Erie site provides links to their schedules of upcoming events, the club's history, the hatchery and many other helpful links for the angler or boater. Erie Pennsylvania Sport Fishing Association: "The EPSFA was formed to educate, enhance and protect the sport fishing in Pennsylvania." 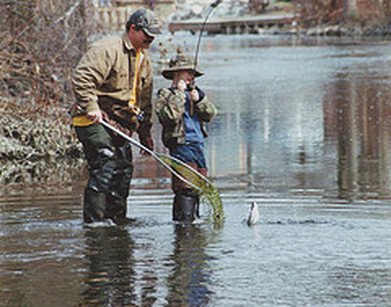 The main focus is the preservation of Pennsylvania's waters and fish. Pennsylvania Sea Grant PSU: Goal is to encourage tourism by promoting the ecological and economic "sustainability in the coastal resources." Recycled Fish "The national non-profit organization of 'anglers living a Lifestyle of Stewardship both on and off the water, because Our Lifestyle Runs Downstream.' We started out talking about Catch and Release, but it's bigger than that now. If we want to catch more and bigger fish today and leave healthy waters for our grandkids, it takes living a Lifestyle of Stewardship both on and off the water."